The top 10 best countries to live in the world are here before your eyes. Have you ever wanted to move out of your boring neighborhood and just go with the flow – visit all of the countries of the world and settle a new home, on a new continent, in a new country, far from all the problems back home? No? Well, you should. And if you will, we’re here to help you decide which country to go to. The problem isn’t necessarily how well you’ll live there although many of these top 10 best countries to live in are mentioned mainly because of UN’s human development index. We’ve thought of all the various factors that could influence the decision-making process. Things like: how easy it is to enter that country? How accepting are the people? How’s the weather (really important)? And then, lastly, how does the country fare on the UN’s development scale? These are the questions to be asked when speaking about the best countries to live in the world. So, are you anxious to know what is the best country in the world? Let’s go to the list and see! I know that this may seem a pretty boring entry to many of you. However, the US still stands strong in the human development score. The biggest problems in the US simply pale in comparison with what other countries have to deal with. All in all, the US is a pretty safe place and it’s an immense stretch of land where anyone can find his or her paradise. As well as a job. The American dream is as bright as it ever was. However, getting there may be quite the challenge for some. Clearly, America had to be part of the list of the best countries to live in. Top features of this best country to live in: land of opportunities, the American dream. This relatively new entry in the world of highly developed countries is as beautiful as it is interesting. Feed your thirst for the exotic with a trip to the island state that leaves millions of tourists each year breathless – from amazement, that is. The country is not only on the rising tide in the human development index, the weather is nice, even in the winter, and the people there are extremely friendly. Top features of this best country to live in: remoteness, exoticism. Exit reality and enter the world of Hobbits, also known as Middle Earth. Of course, saying that New Zealand only stands for Lord of the Rings is an overgeneralization. However, that’s one major reason while the real-estate in the beautiful country has skyrocketed. And that’s also why we’ve ranked this amazing heaven-on-Earth so low: it’s incredibly expensive to move there. Nonetheless, one of the best countries to live in the world. Top features of this best country to live in: beautiful landscapes, remoteness. Going to Canada is seen as strange. Why? We really don’t know. We think it’s got something to do with the cold. Or the double language situation which drives non-French-speaking people away. However, this is really an unjust neglecting of a beautiful country. I for one frankly prefer the mild weather of the Canadian provinces. Top features of this best country to live in: multiculturalism works, ingenious immigration policy. Ask anyone you like: Aussies have it best there in their own paradise-continent over in the Southeast corner of the world – the Land Down Under. If you don’t mind giant spiders, giant snakes, giant crocodiles, and giant everything in general, then this is the best place for you. Jokes aside, Sydney is one of the greatest cities on earth. Given that the country’s also ranked second in the human development index, Australia is well deserving of the number six spot on our list of the 10 best countries to live in. Top features of this best country to live in: multiculturalism, the people are extremely friendly. Living in Germany is a dream for many. The land has had its fair share of problems in the past, but now it’s one of the favorite destinations for people wishing to emigrate. In actual fact, it may well be a strong contender for the best European country to live in. Deutschland has it all: an impressive job market, a good multiculturalism policy, and warmhearted people. Top features of this best country to live in: warm people, good jobs, gothic landscapes, and architecture. The Swiss Alps are some of the most beautiful mountains in the world. However, you won’t be going there for the landscapes necessarily. The Swiss have a long history of ranking high in the human development index. And today the situation hasn’t changed. Switzerland provides a safe-haven for those looking to lead a normal happy life. Top features of this best country to live in: superb tourist destinations, high standard of living. Unlike in Shakespeare’s time, today one can’t really say that there’s “something rotten in Denmark.” Instead, it’s easy to say: there’s something beautiful in Denmark. However, there’s more than one thing: the people, the landscapes, the rivers, or the sea. Generalizing the Scandinavian country just doesn’t seem right. Top features of this best country to live in: education, health care. 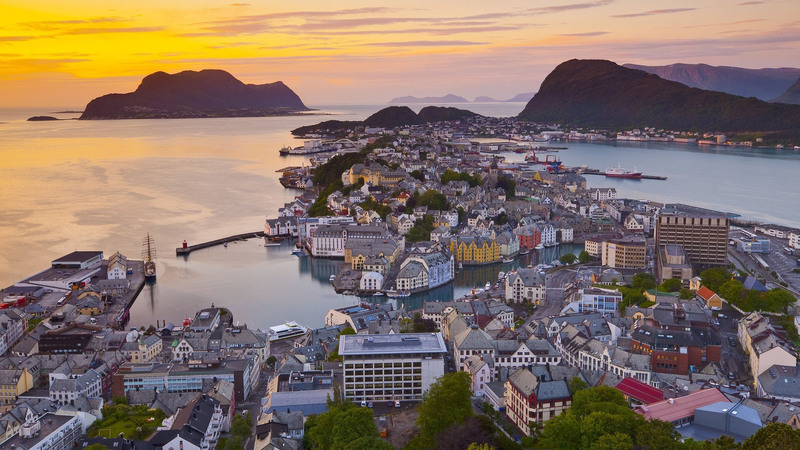 Norway has, for a long time, topped most lists of the best countries to live in. However, few editors of these lists consider the fact that this northern European country is exceptionally cold and, while some may like subzero temperatures, there are many people who will be drawn back by them. Still, if you’re willing to oversee this, Norway is a beautiful country, with some of the most innovative social reforms, a good healthcare system, and an impressive education system. We have to hand it to the Dutch – their small-but-superb country is the perfect mix of good living standards, high human development scores, and a mild climate. The Netherlands, besides being the country of windmills, lakes, and exceptionally good farmers, also houses Amsterdam – largely known as one of the most progressive cities in the world. However, if nightlife isn’t your fancy, then a trip to The Hague may be more up your alley: filled with incredible monuments, the second capital of the Netherlands is equally impressive. Holland (a name of one province often used for the country as a whole) is also home to Europe’s largest port: Rotterdam. This country more than deserves the top spot on our list of the 10 best countries to live in. Top features of this best country to live in: high quality of life, nightlife, culture, landscapes. Did we get your favorite? What do you think of this top list of the best countries to live in? What is the best country to live in, in your opinion? If you have any suggestions, comments, or would think that your country would make a fine addition to this list, feel free to leave a message down below. If your country did make the list of the best countries to live in, be sure to share it with your friends and family.